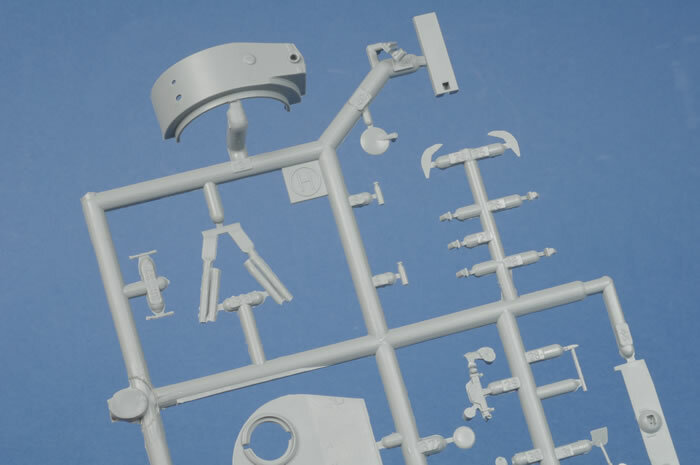 Media and Contents: 144 mid-grey plastic parts on three sprues with the upper and lower hull bagged separately, 16 PE parts on one fret plus two metal pre-formed exhaust guards and a length of multi-strand wire cable, 2 lengths of DS-100 (cream) track, decals for one vehicle and an A5 sized, 2 page instruction sheet with parts plan, 12 build diagrams and one page of paint/decal instructions. Advantages: New early production turret with nothing moulded to turret roof and possibly asymmetric in shape, openable commander's and loader's hatches, upper hull has all tool separate and openable engine hatch, all parts supplied for early production Tiger I (Ausf. H) , except Feifel Air Filter System, and including turret smoke grenade dischargers and X mine throwers. Disadvantages: Kit comes with late model all-steel wheels from an earlier kit which will have some fit problems (idlers), no zimmerit and some flash. 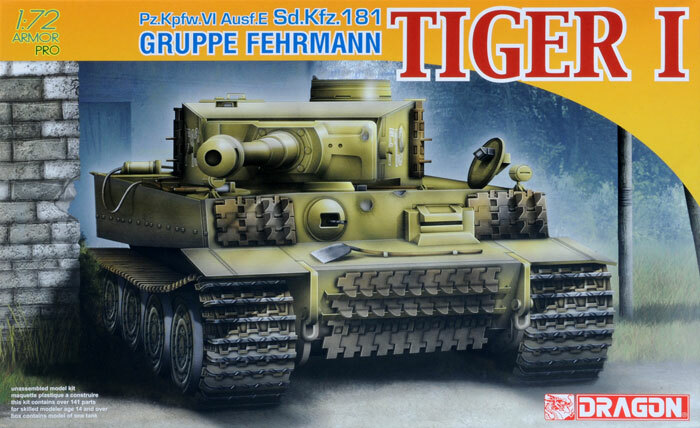 Tigergruppe Fehrmann was set up near war's end, along with other Gruppen, using re-manufactured Tiger Is taken from Tiger Schools and employing the school instructors. The tanks themselves were largely early production Ausf. Hs with zimmerit and late model all-steel road wheels. 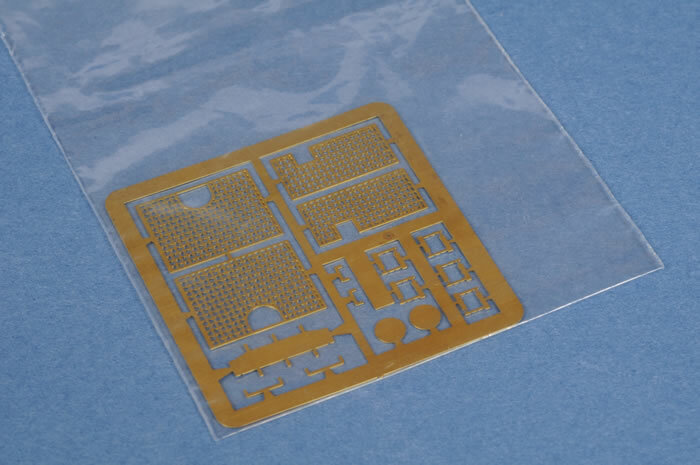 Dragon's 1/72 scale Tiger Is were among the earliest of their Braille Scale kits which were not very good having lots of flash, misaligned mould halves and soft detail. A slight improvement was made when they introduced the kits with zimmerit but only as far as the zimmerit was well done and the mid production wheels were an improvement over the late ones. Dragon then introduced a Tiger “P” based on their earlier Ferdinand/Elephant kits. This resulted in them moulding a whole new Tiger I (early production) turret and they took the opportunity to correct some of the faults in their mid/late Tiger I turrets. The new offerings appears to be asymmetric, as it should be, and the roof has nothing moulded on it which means it can be used for all three, early, mid and late, plus the loader's hatch can now also be modelled open. 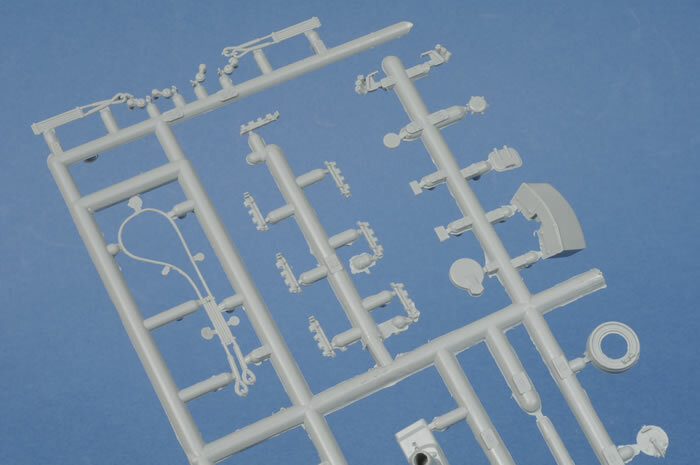 The turret sprue now comes with spare track links for the turret sides, something that was missing from the mid/late production kits and it also has a full set of X mine throwers and the turret mounted smoke grenade dischargers. This then is the turret supplied with this new Gruppe Fehrmann Tiger I. But hey, there's more. 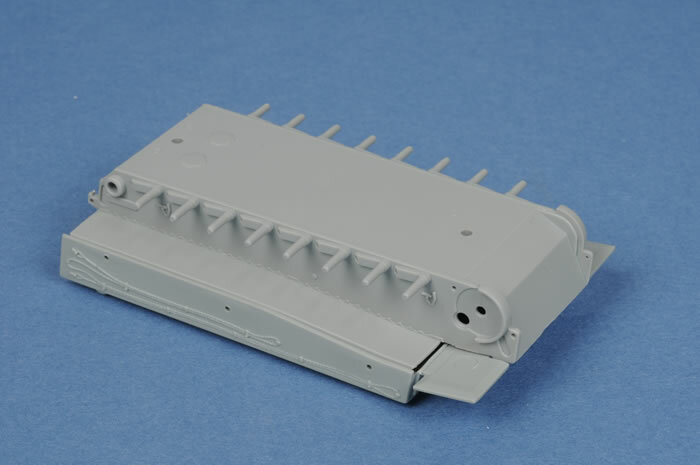 Dragon have also taken the opportunity to remove the tools from the original Tiger I upper hull, putting them separately on the turret sprue along with a now separate engine hatch for the rear deck, just in case you want to put some engine detail in there. We now get the option of full plastic tow cables or the wire ones supplied in the kit plus optional gun mantlets. 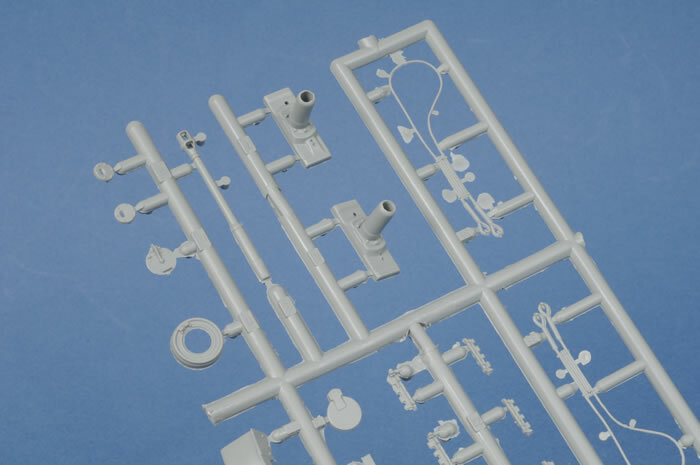 The kit also includes extra track link armour for the upper and lower glacis as used on these Fehrmann Tigers and some earlier ones. 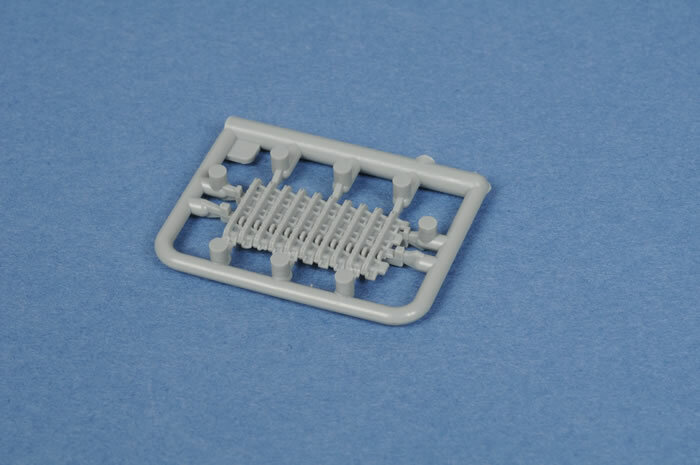 The all-steel road wheel sprue is straight from the earlier late production Tiger I kits which is one of the kit's draw backs. The way they are mounted make them very hard to get all lined up and the idler is too wide and gave me all sorts of problems when I built one of Dragons late Tiger Is. I am told that all of the re-manufactured Tigers had zimmerit applied but this kit does not have it. It's for this, and the troublesome wheels plus there is still some flash evident, that I've only given this kit a “Recommended” instead of a “Highly Recommended”. However, if your interest in this kit is to model one of the many Ausf “H” Tigers, then that is a different matter. If you want to wait, I am sure Dragon will release some of them in the near future considering all they have to add is the mid production wheels, early tracks and Feifel air filters. 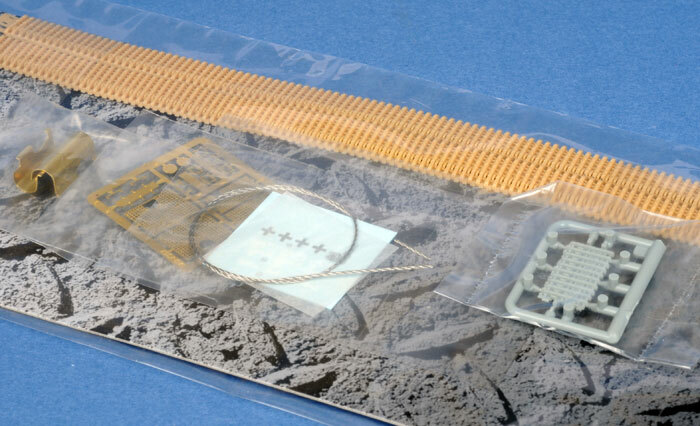 The conversion possibilities of this kit are endless. 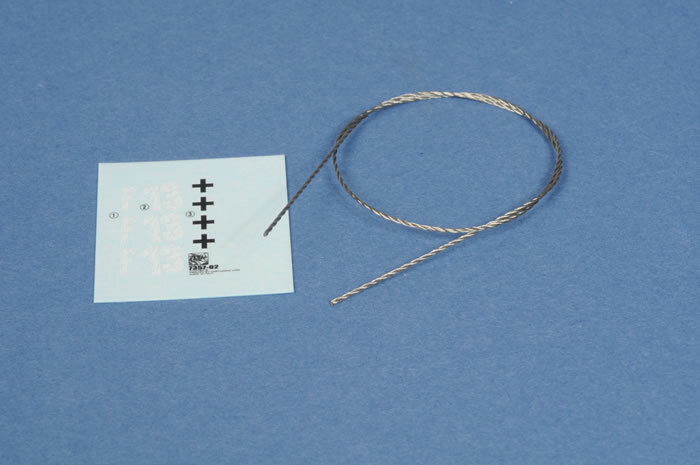 For instance, if you have a Revell Tiger I Ausf “H” kicking around that you don't want to build because of the faults, borrow the wheels, tracks (I know they are late model tracks but if you don't tell, nor will I) and air filters and you have any late/early prod. Tiger. 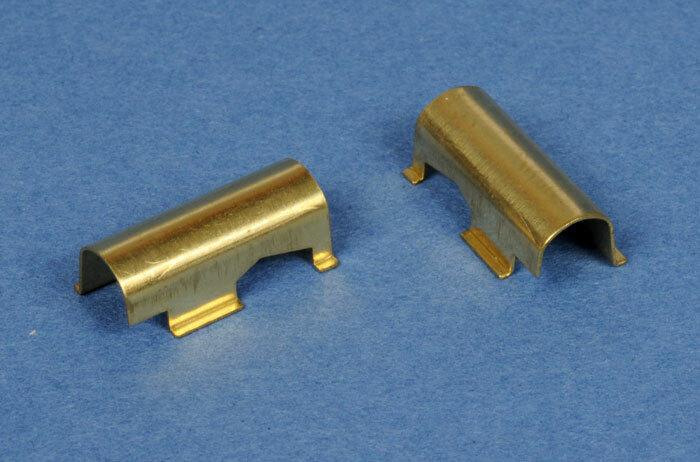 Borrow the exhaust shields from the same kit and you can build an African Tiger. A Panzer III turret box will give you an early Kursk Tiger. If you have a Dragon mid-production Tiger such as the incorrectly named Bergepanzer Tiger that your not happy about then the wheels will fit straight on to this kit with no idler problems although again the tracks are wrong. On and on it goes with only your imagination to hold you back. So, there you have it. Not a brand new kit but a big improvement over what has come before and even more evidence that Dragon are willing to improve their kits.